Self awareness is the starting point to improvement, with both your martial arts and all areas of your life. Self awareness is really knowing you, your personality, your beliefs and motivations. 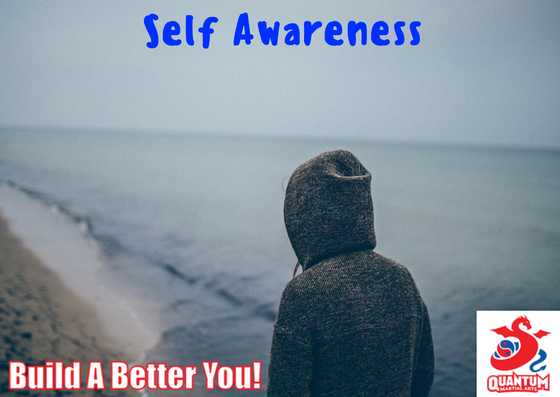 Self awareness will also help you understand other people and their responses, which has obvious self-defence benefits (such as avoiding conflict). Self awareness helps you “create your own destiny”. The way you think, talk and act helps your mindset (including emotions, reactions, thinking and behaviour). Self awareness allows you to see where your mindset is directing you. It helps you take control of your mindset, which helps you make more rational decisions and make any necessary changes to your reactions. If you are not self aware, making the right decisions is all the harder. This can cause unnecessary conflict. Bruce Lee once said, “in order to control myself, I must first accept myself by going with and not against my nature.” This is important part of self-awareness, i.e. being non-judgemental. Do not try to be somebody you are not. This will only cause inner conflict, self-doubt and esteem issues. Instead, accept who you are, be aware of who you are, then use that knowledge in all of your interactions. Self awareness does not just help you. It helps you understand other people. This can help with all of the relationships in your life. In any relationship, there is you and them. If you have a strong awareness of who you are, that is one half of the equation done. You will know how you will react to other people’s behaviours and actions. From a self-defence perspective, this can help avoid disagreements (which is the goal of all martial arts). You can react better if people cut in front at supermarkets or while you are driving. From a relationship perspective, it can help build better bonds with others. In this regard, self-awareness helps build peace and a better society. To help with your self awareness, start by concentrating on the little details in your thoughts and behaviours. Pay attention to your feelings. Pay attention to your reactions. While you are being self aware, think about what decisions you might make early in the process. If you leave decisions until too late, emotion and feeling have built up to the point that you might not make rational choices. Self awareness does not mean that you will not feel negative emotions. However, it will allow you to recognise it and hopefully make the right decisions from there. Make time for you – we spend so much time working and helping others, we sometimes forget about ourselves. For a little bit each day, spend some time reflecting, reading, writing and connecting with yourself. Apply mindfulness – anybody who has practiced martial arts for a while knows the importance of mindfulness. It is a necessary component of self-awareness. Mindfulness is focusing on the present moment and (non-judgementally) observing you and everything going on around you. You can practice mindfulness at any time. I focus on mindfulness when drilling my techniques in the dojo. I also do it on my walk to work. You can do it at any time. Be a good listener – this involves being present and paying attention to other people’s emotions and actions. It is showing empathy without opinion. When you are a good listener to others, you also find you listen well to yourself, which helps with your self awareness. Gain varied viewpoints – get feedback and honest council from people you trust. I have people who’s opinion really counts in all areas of my life. They can see viewpoints that I may not have considered. When this is pointed out to me, it helps with my self awareness and decision making. So do not be afraid to ask for help! For this week, pause, deliberate on your thoughts and feelings, and see what you can learn from all of the events in your life.